It’s time for festivities at Louis Erard, as the watchmaker from Le Noirmont prepares to celebrate 80 years of a rich and diverse history. This anniversary provides an opportunity for this creator of exclusively mechanical watches to reaffirm its dynamism, creativity and expertise through a new line of watches built to last and evocatively named “Excellence”. Impelled by this unique jubilee fervour, the new collection vividly epitomises the brand’s signature codes in a tribute to the origins and traditional values that have forged its strength over eight decades. Classicism and originality, complexity and understatement are combined with great talent, and mingled with exclusivity and accessibility to form a concentrated blend of the qualities characteristic of all timepieces bearing the Louis Erard signature. This new collection comprises a total of seven models – five for men and two for women – all available in steel or rose gold versions. These include Power-Reserve display and Regulator or simple Power-Reserve variations, a Chronograph with moon phases and 24-hour indicator, and three-hand watches. 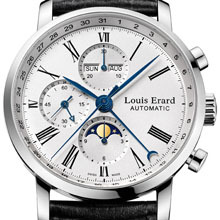 Even though mechanical watchmaking remains the core of the self-winding models, it is undoubtedly in the hand-wound watches that Louis Erard most clearly expresses its vocation as a movement manufacturer. The two manual-winding models incorporate its uncompromisingly sophisticated in-house modules featuring exclusive and unique complications. A round case (36 mm for women and 40 mm for men), an understated white dial, hour-markers and Roman numerals : the key attributes of the Excellence collection offer a clearer than ever reflection of the design codes cherished by Louis Erard, expressed through decidedly neoclassical touches and a wealth of variations. This resolutely Haute Horlogerie spirit offered at unbeatably competitive prices confirms the brand’s status as the watchmaker that counts – in more than one way. In December 2010, the symbolic threshold of 100,000 watches produced in eight years was crossed, offering further proof that the alchemist from Le Noirmont is on top form – and determined to prove to all watchmaking enthusiasts that expertise, quality and small complications are not necessarily beyond reach and can also become an accessible dream ! EXCELLENCE COLLECTION - WHEN EXPERTISE IS MATCHES BY ACCESSIBILITY ! 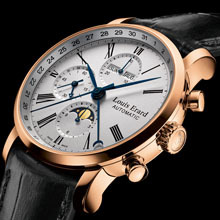 A collection that is by definition neoclassical, Excellence merges watchmaking traditions with a modern approach – twin values that have shaped the destiny of Louis Erard for the past 80 years. The mechanical attraction of an exclusive and varied anniversary collection dedicated to aesthetes looking for authentic and legitimately priced horology.